Betting preview, tips and enhanced odds for Manchester City’s Premier League clash with Chelsea. Two weeks ago Manchester City were looking up at table toppers Liverpool who sat seven points clear. Fast forward to this weekend and Pep Guardiola’s defending champions went back on top after another win over Everton midweek, however Liverpool restored their three point lead yesterday when they turned over Bournemouth. This title race looks set to go down to the wire, however Chelsea will want to have a say this weekend when they visit the Etihad. Form Labs bring you their betting preview and tips for the game and if you are after some value then check out our selection of enhanced odds for the game. Enhanced Odds For Manchester City v Chelsea. Max Bet £25! 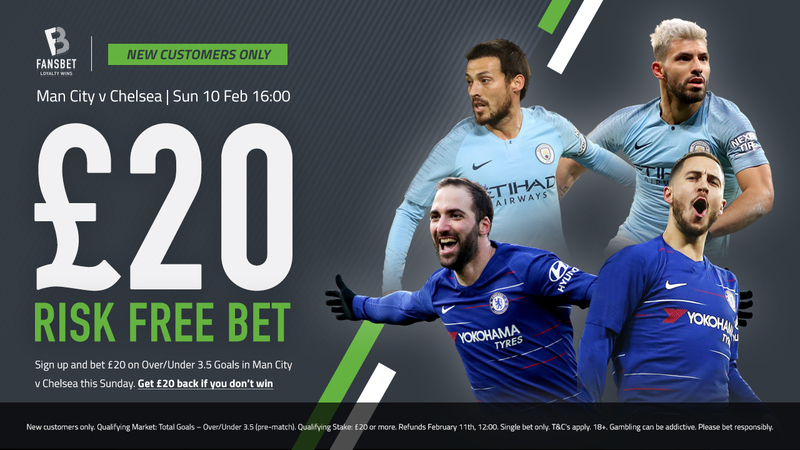 Man City’s defeat away at Newcastle very much appears like a blip as they’ve since recorded a comfortable 3-1 victory hosting Arsenal and battled to a 2-0 success over Everton, returning to the top of the summit in the process, even if Liverpool do hold a game in hand. Although the Reds may well have taken the lead once more by the time this fixture kicks-off, there’ll be no shortage of momentum behind Pep Guardiola and his men and they’ll feel right back in the race no matter what result Jurgen Klopp’s outfit achieve hosting Bournemouth, having briefly threatened to slip out of sight recently. Chelsea have won five consecutive games at the Bridge but aside from their second leg semi-final win over Spurs, they haven’t been especially tested with the others coming against Nottingham Forest, Newcastle, Sheffield Wednesday and Huddersfield. However, their away form has seen them lose three on the spin without even scoring a goal at Spurs, Arsenal and most depressingly going down 4-0 to Bournemouth in their last trip. It hasn’t been a great 2019 so far and the friction between coach and players increasingly looks like derailing their season. Maurizio Sarri will certainly take comfort from his sides’ 5-0 victory over Huddersfield, with Gonzalo Higuain netting his first goals for the club and linking up well with Eden Hazard and his other teammates, though putting a team already consigned to relegation to the sword only carries so much weight. There’s no doubting who’ll be taking the initiative in this clash and indeed, City have opened the scoring in each of their last 15 games across all tournaments, while they were ahead inside half an hour in 13 of these. Meanwhile, 17 of the 20 goals they’ve shipped at the Etihad under Guardiola when facing ‘Big Six’ opponents have come during the second half, so if Chelsea are to make it onto the scoresheet it will likely be in response to failing behind. Guardiola has masterminded win to nil victories over Chelsea in three of four head-to-head meetings since the start of last season, as all four games saw fewer than three goals. Meanwhile, the Blues have trailed at both half-time and full-time in each of their last three road trips to face ‘Big Six’ teams across all competitions, with the last two 1-0 and 2-0 defeats to Spurs and Arsenal respectively. In fact, each of Chelsea’s last four defeats against anyone have seen them fail to find the net, and we’re not convinced they’ll mange it here. Man City have led at both half-time and full-time in six of their last seven league outings, as well as five of seven encounters with ‘Big Six’ teams this term, and we’d prefer to back the hosts that way with the Citizens always capable of a defensive slip-up. Sergio Aguero took the lead for City after just 24 and 46 seconds against Newcastle and Arsenal respectively, netting his 10th Premier League hat-trick when facing the Gunners, and while he didn’t make it onto the scoresheet at Everton, he holds a fantastic record versus Chelsea and will fancy his chances once more. The Argentine has 12 goals in 17 career appearances against the Blues, including seven strikes in six matches since 2015/16, striking first in three of the last four matches he’s registered. Moreover, the Argentine has drawn first blood in four of the five games in 2019 in which he’s found the net too and can do so again here.